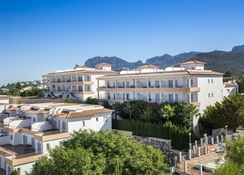 Bellavista Residencial is a family-friendly aparthotel complex set atop the majestic Mount Pego hill, in the scenic north of Costa Blanca. The hotel serves up spectacular views of the hills and the La Marjal Nature Reserve – perfect if you want an idyllic stay. Featuring a large outdoor swimming pool and a children's pool (heated in the winter months), a fully-equipped gym, sauna, hot tub and Turkish bath, this is the perfect holiday retreat for guests wanting a splash of R&R in the Costa Blanca sunshine. The self-catering guestrooms are all furnished with kitchens and terraces/balconies offering gorgeous views of the sea or mountains. Want to explore the surrounding area? There is a variety of bars and restaurants to discover at the Pego town centre, 10-minutes away, or why not try your hand at a round of golf, with a well-manicured golf course just a few km away? Bellavista Residencial is situated atop of Monte Pego, north Costa Blanca, and offers excellent views of the Marjal Nature Reserve and mountains. Located between Gandia and Denia, the property is nearly 95km from the nearest airport, Alicante. The lovely beaches of Las Marinas and Les Deveses Denia are only a few km away, while for shopping and dining options, guest can visit the Pego town centre, approximately 10 minutes away. This aparthotel has 26 furnished guest apartments with terraces spread across two buildings in a cosy, quiet locality away from the town. The spacious apartments house up to 6 guests and come in a variety of categories, namely—1 Bedroom Superior Sea View, 2 Bedroom Standard, 2 Bedroom Sea View, 2 Bedroom Superior Sea View Residence, 2 Bedroom Deluxe Sea View, 3 Bedroom Garden, 3 Bedroom Deluxe Sea View and 3 Bedroom Sea View Penthouse. The apartments are equipped with one or two en-suite bathrooms, a fully equipped kitchen with a freezer, fridge, oven, washing machine, and electric hob. A well-appointed living room with satellite TV, including dining area, terrace and WiFi are also available in the apartments. Bellavista Residencial aparthotel is self-catering and well-equipped kitchens are provided in the guestrooms for guests to cook their own food. Groceries are available nearby. However, for those with self-catering or half board options, there is an air-conditioned restaurant specializing in traditional Spanish cuisine and pool-side bar serving delicious light bites. Guests at Bellavista Residencial aparthotel can spend time relaxing by the inviting hotel pool, but for those a little more active, there are plenty of amenities to keep up entertainment levels. The hotel offers facilities for recreation such as mini-golf, table tennis, hiking, cycling, horse riding, watersports including wind and kite surfing, plus boat trips, sailing and canoeing. If you want to explore the surrounding resort, guests can also visit the nearby Pego town centre or gorgeous beaches of Las Marinas and Les Deveses Denia, situated just a few km away.